Anton Rosinke was born at Rheda in West Prussia on December 18th, 1881.His father was a fisherman. He trained as a blacksmith. He then with his brother Johann as migrant workers moved to Dusseldorf in 1904. There he worked at the Mannesmann steel mills. At first a member of the Social Democratic Party, he became one of the most active anarchists in the Rhineland. He was involved in the Anarchistischen PropagandaVerein Dusseldorf (Dusseldorf Anarchist Propaganda Association) before World War One. Most of his spare time was spent distributing propaganda. As a result, he came to the attention of the political police. 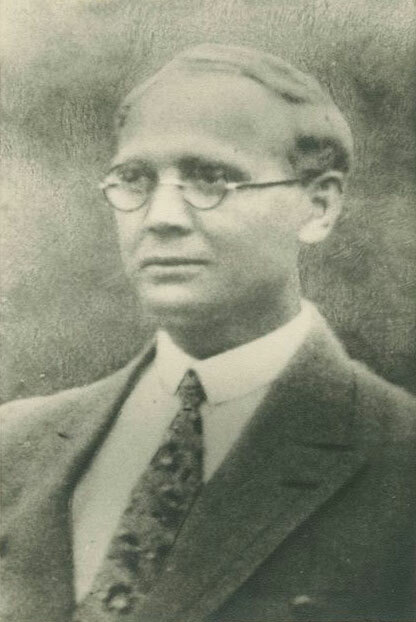 He moved to Gerresheim, a suburb of Dusseldorf, and married Martha Abraham and they had four children by 1912.He became a member of the anarchist-oriented singing group Freie Sänger 04 at Gerresheim. At the beginning of the World War he was arrested on August 1st 1914, for his anti-militarist opposition to the war and his involvement in the Freie Vereinigung Deutscher Gewerkschaften-Free Association of German Unions, the predecessor of the anarcho-syndicalist Freie Arbeiter Union Deutsclands (FAUD) imprisoned up until February 1915 and then briefly called up for military service. In 1921 he was involved in setting up the Freie Erde (Free Earth) settlement in Dusseldorf-Eller which was based on the ideas of Gustav Landauer. This was a piece of barren land between the swamp and the Unterbach lake, It was initiated by Anna and Waldemar Kutschke. Artists like Gert Wollheim also supported this venture. A solid stone house was built and the land was cultivated. Since it could not be agreed by the municipalities of Dusseldorf and Erkrath on whose land the settlement was situated, the inhabitants were more or less left alone. It survived the Nazi period because of its remoteness and the Kutschkes gave asylum to Jewish people there. Anton Rosinke was active in the FAUD. His son-in-law Ernst Binder was also very active in the FAUD. He moved to the Freiheit (Freedom) settlement at Vennhausen in 1922. He was involved in agitation for the setting up of secular schools. With his eldest daughter he organised free children’s and youth groups. The FAUD had warned about the Fascist threat from the 1920s and had argued for counter-measures which were ignored by the mainstream left. The FAUD had 18,000 members in Dusseldorf alone in this period but by the early thirties the FAUD as a whole had shrunk to a few thousand throughout Germany. With the Nazi rise to power Rosinke tried to organise armed resistance in Dusseldorf. He took part in setting up an underground FAUD network in Dusseldorf with Gerhard Lasarzick. He produced leaflets and newsletters with the couple Paul and Gees Helberg who ran a small printshop. He helped distribute the famous “Eat German fruit and stay healthy” brochures whose covers hid the “What We Anarcho-Syndicalists Want” booklet in 1934. He was briefly arrested by the Nazis that year, spending eight days in jail. The Helbergs’ printshop was discovered by the Gestapo but they later managed to escape to Spain. Despite this, Rosinke and his comrades continued to smuggle refugees over the border as well as volunteers for Spain. They also set up a solidarity fund for Spain. The Gestapo smashed the Mönchengladbach anarchist group in November 1936. Thanks to the information extracted under torture they then proceeded to round up more than 100 anarchists in eleven Rhineland towns in the next three months. On January 27, 1937 Rosinke and 23 other Dusseldorf anarchists were arrested. Lasarzick received six years imprisonment, and the others from nine months (Käthe Windhoff) to four and a half years (Michael Zeck). As to Anton Rosinke, after his first arrest he had predicted that “If they fetch me again they will not let me out alive”. He was beaten to death in the Gestapo office on Jürgensplatz on 14th February 1937.